Note: The Toga fonts were obsolete due to the creation of the DejaVu Sans Condensed font, but now DejaVu Sans Condensed has been merged into DejaVu Sans in a way that makes it unusable in many popular programs, such as Firefox, the Ubuntu GNOME desktop, etc. Feel free to use Toga Sans in place of DejaVu Sans Condensed, but keep in mind that as a derivative of the original Bitstream Vera Sans, Toga lacks some of the Unicode glyphs added to DejaVu. Obtaining an older version of DejaVu that contains the separate Condensed font will work better for you if you need those. Toga Sans™ is the result of an evening spent with the Bitstream Vera Sans™ font and the pfaedit program. Essentially, just as Microsoft's Tahoma™ was designed as a screen-width friendlier version of their Verdana™ (and Bitstream Vera Sans appears to have been strongly influenced by Verdana), Toga is meant to be a narrower version of Vera. In fact, that's what it literally is, because I ended up just using "scale" on all the characters and then adjusting the metrics accordingly. It looks better than the versions where I tried to manually adjust kern pairs and whatnot. Per the Bitstream Vera Sans license agreement, I have renamed the font and removed Bitstream's name despite the minimal amount of work I did, and this modified font is available under the same terms. Update 2003-10-03: The new version is 0.20. The changes in this version include a 90% reduction in file size and hopefully improved compatibility with Windows XP, both due to removing some 65,000 empty glyphs. 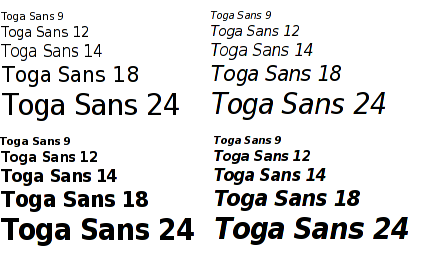 As you can see from the screenshot above, I also did a Toga Serif, similarly to how I did Toga Sans. Additionally, the RPM package is more in line with the other font packages available for Mandrake; I'd based it on a Red Hat spec file previously which was causing the fonts to work everywhere but OpenOffice. I'm using Toga Sans as my default font now and it looks very nice, but I have no idea what I may have done to other encodings, special characters, non-antialiased usage, etc. I'm putting it out there because (a) I and many others have been wanting a font as pretty as Bitstream Vera Sans but narrower for screen use, and (b) I'm hoping a "real" font designer will get annoyed at this quick hack and do a real "Bitstream Vera Sans Condensed". :) The same goes for the serif font, but to a lesser extent. While the version is 0.20, I don't foresee any need for updates unless another problem is discovered or the original Vera fonts get a major update, so I guess this is sort of equivalent to a 1.0 release.